​ The BigDataEurope ​ ​project has set up a survey identifying current and future challenges for Big data and data management in the seven H2020 societal challenge topics. The primary objective of the survey will be to elicit requirements for the big data integrator platform. Followed by a focus on reviewing the architecture for prototype implementation, and platform evaluation and showcasing, in the second and third year. The planned BigDataEurope platform will offer to the interested participating third parties the opportunities of the latest European RTD developments, including real-time streaming, multilingual data harvesting, data analytics and data visualisation. The broad targeted survey will investigate on how this development should be shaped to the specific pre-conditions and needs in sectors like Health, Pharma, Climate, Energy, Agriculture, Well-being, Society and Security. 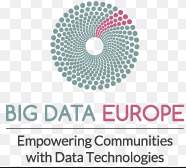 BigDataEurope project asks for participation in the survey from now on ​the next five weeks.